This month's new painting by Kim is entitled 'A Table of Hope'. Interestingly, the Bible has volumes to say about hope and also a lot to say about tables. 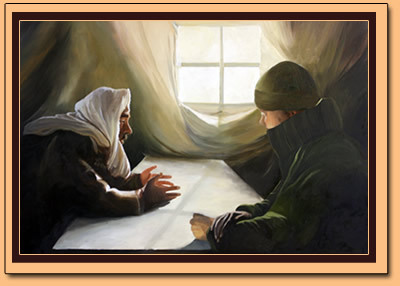 For example, Jesus, in a conversation with His disciples, speaks of a table of intimate fellowship in Luke 22:30. Referring to heaven, He plainly states that those who love and follow Him will "eat and drink at My table in My kingdom". The Bible says that man is at enmity with God. Yet, God graciously extends a loving invitation to come and reason with Him. Someone has estimated that there are 624 invitations in the Bible that invite us to come to God for forgiveness and redemption. God takes the initiative and issues an amazing invitation to His sinful creation. The reason why God takes the first step in salvation is simply because we, in our spiritual deadness and destitution, are incapable of taking a step without His help. Only God has the ability to turn the pathway of darkness and rebellion into a pathway of light and peace. Further, in 1 Cor. 10: 21 the Apostle Paul speaks about the Lord's Table, where Christians gather in Holy Communion to remember the Lord Jesus’ sacrifice for our sins on the cross. The Lord's Table is more than a table of remembrance. It is also a table of hope, for Jesus promised that He is coming again to receive His church, that His saints might reign with Him forever. Finally, in Psalm 23:5 the table speaks figuratively about the gracious provision of God. It says, "You prepare a table before me in the presence of my enemies". Kim's painting depicts two men representing two opposing positions, sitting face to face in an attempt to find a common place of agreement. The table is more than a table of wood. It is now “a table of hope”! By God's grace, when they stand to say good bye, they will have achieved a lifeline of hope. Hope is exactly what we all need. Hope for today. Hope for tomorrow. Hope for eternity. Only Christ can bring hope to lost sinners. The Bible calls it "a better hope". Hebrews 7:19. This belief and commitment allows us, by God's immeasurable grace, to sit at the Lord's Table of Hope in heaven!